Diaphragm switches are simple, pressure sensitive level devices in which a mechanical system activates a switch when enough material has accumulated against the device. These level switches are most effective when the material in the tank is dry and free-flowing. They should not be used with pneumatic conveying. This electromechanical device functions on the principle of material resistance. A small motor drives the rotation of the paddle wheel. When there is no material present the paddle rotates freely; when there is material present, the paddle is prevented from rotating. When the paddle wheel stops moving, electric switches or relays within the enclosure will trip, signaling an alert. The original Roto-Bin-Dicator® was developed in 1954 to overcome false measurement readings brought on by the introduction of pneumatic conveying when using diaphragm switches. In addition to the original model, there are now more advanced models to choose from – like the Roto-Bin-Dicator® PRO. The Roto PRO is a genuine fail-safe paddle wheel level switch that has the ability to self-diagnose while in material as well as differentiate between the faults that it detects. RF sensors use radio frequency capacitance to detect the presence or absence of material in a vessel. The VRF® II Series self-calibrate to the empty conditions in the vessel by compensating for the load of the probe and vessel environment and to automatically determine the optimal operating frequency for the greatest sensitivity and stability. Bindicator’s VRF® II Series radio frequency sensor comes in standard and advanced models to enable customers to choose the options that best suit their application and needs. These point level switches use electronic vibratory technology to sense the material. Vibrating element level sensors vibrate until they come into contact with material, causing an output relay change (alarm). These products work best in lightweight and free flowing materials. The operation of these point level sensors is not affected by the dielectric constant of the material being measured – because of this, the Pulse Point™ II Series by Bindicator® is suitable for applications where the material in the vessel may aerate or become too light for other technologies to sense it. A lag moves the sensor's electronics away from the vessel - this protects them from high temperature environments (such as radiant heat from the side wall or extreme heat that might be conducted from the process media through the standard process connection to the electronics). An extension allows the sensor to be positioned further into the vessel – this may be done in order to get through a thicker vessel wall or to position the sensor lower into the silo. If you have any questions concerning point level measurement please call 800.778.9242 to speak with customer support or email info@bindicator.com. 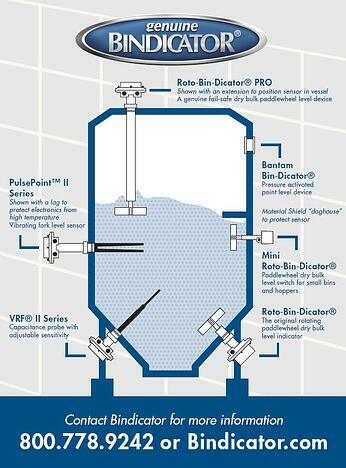 Stay tuned for next month’s Silo Series Blog on continuous level measurement!